Mother nature is very generous, in that she provides ample vegetables for cooks to get creative with. Vegetables are the color palette of a cook’s creation, and eggplant is my favorite color. Who wouldn’t love that spongey texture and mildly bitter flavor? Now that I am separated from my mom by several states, a home-cooked meal made with mother’s love is hard to come by. Thankfully, whenever I go home for a visit, the first thing Mama Choi asks me is, “what can I make you for dinner?”. My top two responses are spring rolls and Chinese stuffed eggplant. The latter is a dish I was craving intensely. It’s Chinese eggplant, stuffed with an amazing shrimp and pork filling and cooked in a delicious garlicky sauce. Because I couldn’t wait any longer to have it and was very interested in finally making it myself, I called up my mom and asked her to recite her recipe to me. Whenever I try to copy her recipes, something is always off. That is why I gave up the idea that my dishes will taste identical to hers. Instead of trying to mimic her recipes, I recreate them and add my own touches. 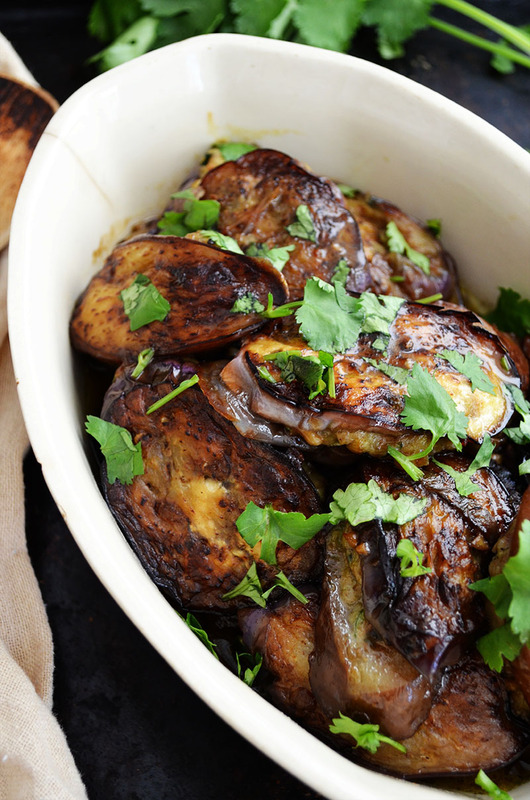 This delicious eggplant dish is something that she would prepare as a weeknight dinner. Although it may seem complex, it is not difficult and worth all the effort. The pork and shrimp filling is so tasty, and I can’t think of anything that goes better with it than eggplant. One major change I made to my mom’s original recipe is that I added freshly grated zucchini to make the filling lighter. Plus, I never pass up an opportunity to increase the vegetable content in my meals. Once you gathered all the ingredients for the filling in a large bowl and mixed it all together with your hands, you simply sandwich the filling between two slices of eggplant. Then it’s off to the frying pan and soon after, into your stomach! For the sauce: In a small mixing bowl, whisk together all the ingredients, except for the garlic, then set aside. For the filling: In a large bowl, combine all the ingredients and mix with your hands, then set aside. Spoon a tablespoon of the stuffing onto the center of a slice of eggplant, then place another slice of eggplant on top (like a sandwich) and gently press down. Repeat this step with the rest of the eggplant slices. Over medium heat, pour enough oil into a large frying pan to form a layer about 1/16 inch thick. Working in batches, gently place the eggplant and fry for four minutes, turning over once halfway. Add more oil if needed. Transfer onto a plate, then set aside. After all the stuffed eggplant is fried and plated, add one tablespoon of oil into the pan, then add the remaining minced garlic. Cook the garlic for 20-25 seconds, then pour in the sauce. Cook for one to two minutes, until the sauce slightly thickens (add more water if the sauce becomes too thick). Return all the eggplant into the pan, reduce the heat to medium-low, and cover. Cook for ten to fifteen minutes, until the stuffing is cooked through. Plate, and garnish with chopped cilantro or slice green onions (optional). Serve warm with rice. This entry was posted in Entrees and tagged Chinese, eggplant, pork, shrimp. Looks and sounds delicious. Everything my mom makes me always tastes better than when I make it myself! Thank you Liz! Something about that mother’s touch always makes food delicious! 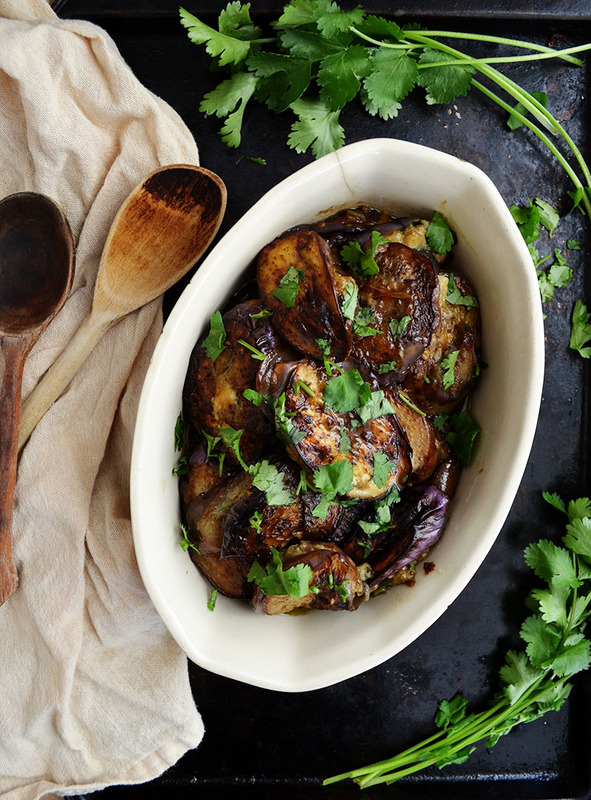 This eggplant dish is beautiful! I love the blistered look of the eggplants and the sauce. Also they are stuffed!! That is so cool. I have to try this! Thank you Sarah! Please let me know what you think if you try it (: It’s so delicious! We are so lucky to have such wonderful moms!